Project Management is the discipline of planning, organizing, and managing resources to bring about the successful completion of specific project goals and objectives. A project is a finite endeavor-having specific start and completion dates-undertaken to create a unique product or service which brings about beneficial change or added value. This finite characteristic of projects stands in sharp contrast to processes, or operations, which are permanent or semi-permanent functional work to repetitively produce the same product or service. In practice, the management of these two systems is often found to be quite different, and as such requires the development of distinct technical skills and the adoption of separate management philosophy, which is the subject of this article. The primary challenge of project management is to achieve all of the project goals and objectives while adhering to classic project constraints-usually scope, quality, time and budget. The secondary-and more ambitious-challenge is to optimize the allocation and integration of inputs necessary to meet pre-defined objectives. A project is a carefully defined set of activities that use resources (money, people, materials, energy, space, provisions, communication, motivation, etc.) to achieve the project goals and objectives. Like any human undertaking, projects need to be performed and delivered under certain constraints. Traditionally, these constraints have been listed as “scope,” “time,” and “cost”. 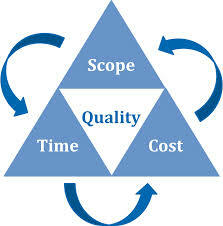 These are also referred to as the “Project Management Triangle,” where each side represents a constraint. One side of the triangle cannot be changed without affecting the others. A further refinement of the constraints separates product “quality” or “performance” from scope, and turns quality into a fourth constraint. Regardless of the methodology used, the project development process will have the same major stages: initiation, planning or development, production or execution, maintenance and controlling, and closing.